These Candy Crush Saga Dreamworld level 83 cheats and tips to show you how to beat level 83 of Candy Crush Dreamworld. The goal of level 83 is to clear 3 jellies in 25 moves and score at least 25,000 points. In level 83 you must clear 3 jellies in 25 moves or less and score at least 25,000 points. Begin by using striped candy to clear licorice blockers. These blockers are concealing candies that you will need to make combinations. In each corner there will be a licorice swirl with jelly underneath. Use plenty of candy combinations to clear the jelly squares in the corners. 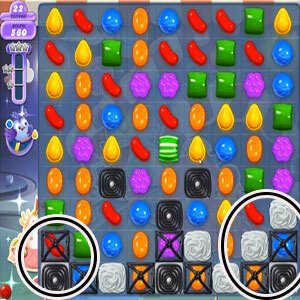 Combining striped horizontal candies with vertical candies is a great way to clear up jelly squares in this level. You can combine striped candy with wrapped candy to clear 3x more area. This will give you more points without wasting moves. For this level, its crucial to use Odus to your advantage. You’ll want to keep Odus happy and balanced so he can activate moon struck for you. When you have enough points on your moon scale, sugar crush will activate all of the jelly fish, which will eat more candy and give you more points toward you final score.